Louis V (c. 966 – 21 May 987), also known as Louis the Do-Nothing (French: Louis le Fainéant), was the King of West Francia from 986 until his premature death a year later. During his reign, the nobility essentially ruled the country. Dying childless, he was the last monarch in the Carolingian line in West Francia. 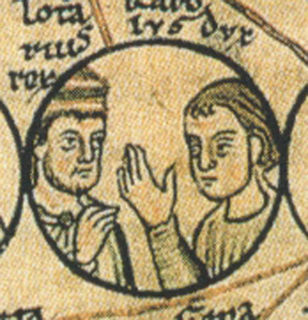 The eldest son of King Lothair and his wife Emma of Italy, daughter of Lothair II of Italy, Louis was born c. 966. His father associated him to the government in 978 and had him officially crowned as co-king on 8 June 979 at the Abbey of Saint-Corneille in Compiègne by Archbishop Adalbero of Reims; and he assumed full power after Lothair's death in 986. Louis V was the last Carolingian King of West Francia and reigned in Laon from 2 March, 986 until his death, at the age of 20, in 21 May, 987. In 982 at Vieille-Brioude, Haute-Loire, the fifteen year old Louis was married to the forty-year-old Adelaide-Blanche of Anjou, sister of Count Geoffrey I and twice a widow from her previous marriage with Count Stephen of Gévaudan and Count Raymond of Toulouse, Prince of Gothia. This union was purely political and arranged by the king – following the advices of Queen Emma and Count Geoffrey I – with the double purpose of restoring the Carolingian royal power in the south of the kingdom, and (according to Richerus) to obtain the support of the local southern lords in his fight against the Robertians: being now related by marriage to two of the most powerful southern comital families of the Kingdom, Lothair believed that he could confront the power of Hugh Capet. [...] They had almost no conjugal love; because Louis barely leave the puberty, and Adelaide was old, among them were only incompatibility and disagreements. The didn't shared a common chamber and in this way they can't suffer with the presence of the other; when they had to travel, each took a separate residence, and when they were forced to talk, their conversations were in the open air and never were long but only a few words. They lived in this way for two years, until they obtained the divorce not only for their opposite characters but also because Louis, who at that point was unmanageable due his youth, indulged himself in all sorts of frivolity. When the young prince reached adolescence, Lothair made him king and appointed him his successor; he also chooses for him a princess of Aquitaine as his wife, but soon she perceived that the young man didn't inherit the talents of his father. Therefore she decided to separate from her husband; and for this purpose she adroitly convinced him to make a trip to her province of Aquitaine, assuming that his hereditary rights there guaranteed him the possession of the land. Louis, without suspecting the artifice, yielded to the advice of his wife, and went with her. When they were in Aquitaine, she left her husband to join his family. However, despite being recorded by relative contemporary and later sources (Richerus, Rodulfus Glaber, the Chronicon Andegavensi and the Chronicle of Saint-Maxence, among others), the existence of this marriage was recently challenged by historian Carlrichard Brülh. Upon his father's death on 2 March 986, the already-crowned Louis V became the undisputed King of the Franks. At that time, however, there existed in the Frankish court two factions: one led by Archbishop Adalberon of Reims and Queen Emma, who, being strongly influenced by her mother Empress Adelaide, wanted the renewal of friendly relationships with the Ottonian dynasty; the other faction wanted to continue Lothair's policy, and taking advantage of the minority of Emperor Otto III, wanted a policy of expansion to the east and the recovery of Lotharingia. In addition, the young monarch inherited a battle between his father's line of elected kings (which had been interrupted twice by the Robertian kings and once by the Bosonid family), and the Ottonian house of the Holy Roman Emperor Otto I. As defender of Rome, Otto I had the power to name the clergy in Carolingian territory, and the clergy he had named were not supporting the Carolingians. 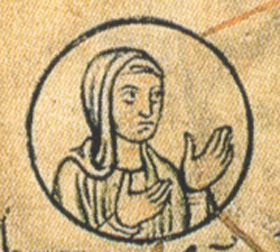 Initially, Queen Emma dominated the situation, but in the summer of 986 there was a reversal: The Anti-Ottonian party prevailed, after which she was forced to leave court and seek refuge with Hugh Capet. This event also put Adalberon in a predicament: having been elevated by Otto I to the powerful archbishopric of Reims, he was forced to leave his episcopal seat and took refuge in one of his fortresses on the Meuse river, who belonged to the Ottonian sphere. The escape of the Archbishop was perceived by Louis V as treason; he turned violently against Adalberon and threatened him with a siege of Reims. The matter was finally settled in a trial court at Compiègne. Before this meeting, however, Louis V changed his mind and sought a reconciliation with Adalberon, and so in the spring of 987, he planned a peace meeting with Empress Theophanu, who could act on behalf of her son Otto III. Before all these tangled events were resolved, Louis V died on 21 May 987 from a fall while hunting in the Forest of Halatte near the town of Senlis, Oise. He was buried in the Abbey of Saint-Corneille in Compiègne. He left no legitimate heirs, so his uncle Charles, Duke of Lower Lorraine, was nominated as the hereditary successor to the throne. But the clergy, including both Adalberon and Gerbert (who later became Pope Sylvester II), argued eloquently for the election of Hugh Capet, who was not only of royal blood but had proven himself through his actions and his military might. Capet was elected to the Frankish throne and Adalberon crowned him, all within two months of Louis V's death. 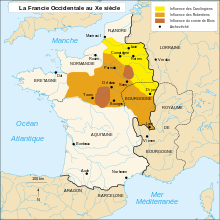 Thus the rule of the Carolingian dynasty ended and the Capetian era had begun. ^ Previté-Orton 1929, p. 568. ^ a b Bernard S. Bachrach: Fulk Nerra the Neo-Roman Consul, 987-1040, University of California Press, 1993, p. 15. ^ Richerus: Historiarum libri quatuor, Académie impériale de Reims, Reims 1855, Book III, p. 339. ^ Rodulfus Glaber: Collection des mémoires de France par M. Guizot, Paris 1824, Book I, chapter III, parts 180 and 181. Frantz Funck-Brentano: National History of France. New York : AMS Press, 1967. Ferdinand Lot: Les derniers Carolingiens: Lothaire, Louis V, Charles de Lorraine (954–991), Paris 1891. Walther Kienast: Deutschland und Frankreich in der Kaiserzeit (900–1270), vol. 1, Hiersemann, Stuttgart 1974. Previté-Orton, C. W. (1929). Outlines of Medieval History. Cambridge University Press.